These 1994 - 2009 Dodge Ram 2500 wheel spacers are precision engineered to widen your tire track by 1.5" on each side, improving the look of your vehicle and accommodating wider custom rims and tires. Supreme Suspensions products are developed and rigorously tested by in-house ASE certified specialists, in conjunction with dealerships and professional racers across the United States. Our Pro-Billet Series Wheel Spacers are CNC machined from solid blocks of T6 Aircraft Billet and receive a special anodized coating. Renowned for its sheer strength and light weight, this premium material is guaranteed to withstand even the most extreme environments. Each spacer features splined studs that are pressed into place rather than glued as in many of the lesser, knock-off wheel spacers on the market. Once our spacers are properly installed, they stay installed without the risk of vibrations or imbalance. Please verify fitment compatibility prior to ordering. Your factory wheel studs may need to be shortened to ensure safe fitment of the wheel. 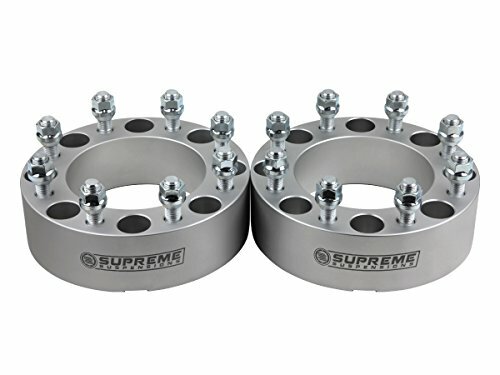 This Ram 2500 wheel spacer kit includes: (2pc) Aerospace-Grade Billet Wheel Spacers with Precision-Machined Splined Studs, Installation Hardware, and Supreme Suspensions Pro Pack. If you have any questions about this product by Supreme Suspensions, contact us by completing and submitting the form below. If you are looking for a specif part number, please include it with your message.